Double Action Chews are Nylabone’s newest dental chew toys that feature a double action, for cleaning and freshening and satisfying chewing. Nylabone Double Action Chews has different options and/or variations, please choose below. • The minty fresh hard natural rubber center bar makes it easy to carry. • The ends are bacon flavored Nylabone, durable enough for powerful chewers. • Dental nubs help control tartar. Regular (Small): 16 - 25 lbs. Wolf (Medium): 26 - 35 lbs. Souper (Large: 36 -50 lbs. 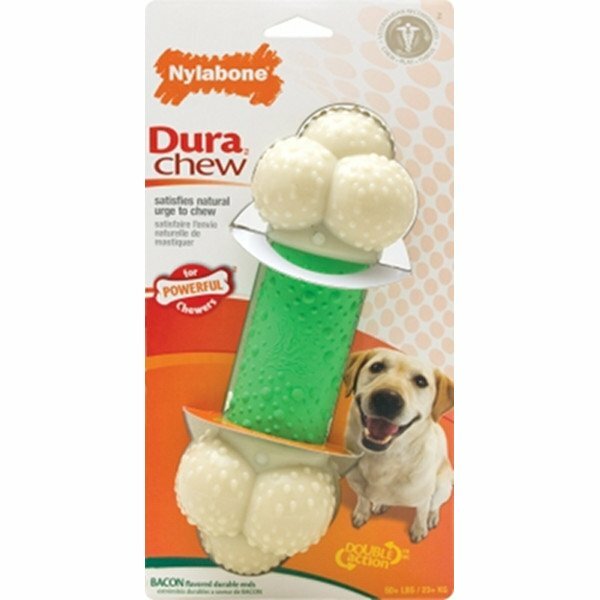 Durable chew for dogs features a soft portion with a minty center for easy carrying. 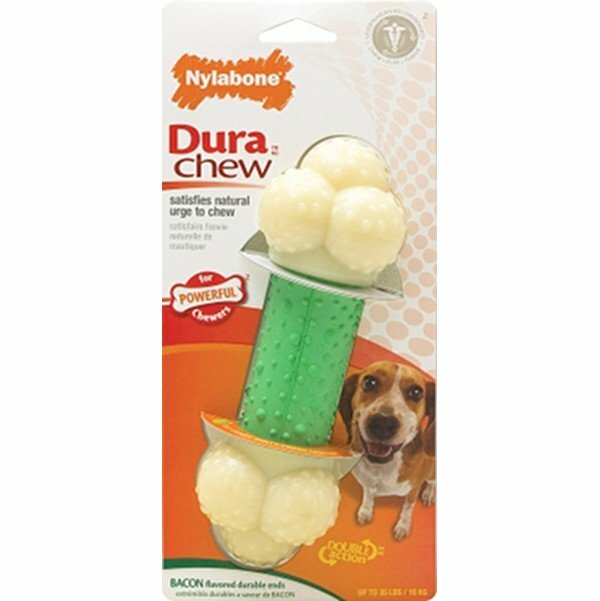 The ends are durable for powerful chewers. The small nubbins gently clean the teeth. Bristle-like projections raised during chewing also help to clean the teeth.Nylon, Natural Rubber, Peppermint, Natural Flavor. Not Consumable. Small Pieces No Larger Than A Grain Of Rice Should Pass Through Without Difficulty. Replace When Knucles On Ends Are Worn. Supervise Pet When It Is Chewing On This Toy. Size: Regular. Bristle-like projections raised during chewing also help to clean the teeth.Nylon, Natural Rubber, Peppermint, Natural Flavor. Not Consumable. Small Pieces No Larger Than A Grain Of Rice Should Pass Through Without Difficulty. Replace When Knuckles On Ends Are Worn. Supervise Your Pet When It Chews On This Toy. Size: Souper. Bristle-like projection raised during chewing also help to clean the teeth.Nylon, Natural Rubber, Peppermint, Natural Flavor. Not Consumable. Small Pieces No Larger Than A Grain Of Rice Should Pass Through Safely. Replace Toy When Knuckles On Ends Are Worn Down. Supervise Your Pet As It Chews On This Toy. Size: Wolf.